Polarization in the cosmic microwave background (CMB) is in the news again. This time with new results from a project known as POLARBEAR. The results were published this week in the Astrophysical Journal, and it swings the observational needle back towards the existence of cosmic inflation. 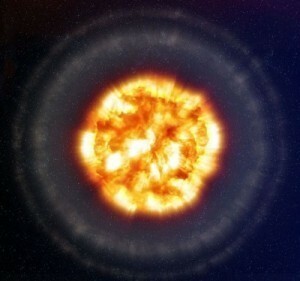 The evidence for cosmic inflation has been very publicly playing out in the media. It began with BICEP2 announcing that they had discovered evidence of primordial gravitational waves, which is a signature of early cosmic inflation. After their public announcement there was a flurry of criticism, particularly on whether BICEP2 had eliminated the effects of dust from their data. The BICEP2 paper did make it through peer review, but then the Planck team showed pretty clearly that dust was still a problem. It began to look like perhaps the entire “signal” of BICEP2 was due to dust. Now POLARBEAR has tossed their hat into the ring. Their paper is more cautious, and they waited until surviving peer review before announcing it. As with BICEP2, it all comes down to dust, and whether its effects can be eliminated from the data. Different modes of CMB polarization. Like the other projects, POLARBEAR has been observing polarized light within the cosmic microwave background, specifically a type of polarization known as B-mode polarization. The CMB is polarized due to the small fluctuations in temperature and density that existed at the time. 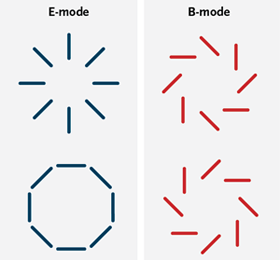 This primordial polarization is known as E-mode polarization. If there was cosmic inflation in the early universe, then the primordial gravitational waves of inflation would distort some of the E-mode into B-mode polarization. The way POLARBEAR dealt with this challenge is two-fold. First, they took data from regions of the sky where dust contamination is at a minimum. Second, they gathered data at a higher resolution. This latter part is important, because at higher resolutions B-mode signals from gravitational lensing should be more dominant than those due to dust. They then did something rather interesting. Taking their data they tried to see if they could subtract out all the contaminating sources to get a null result. In other words, started with the assumption that everything was a contaminant, and then tested whether that model worked. What they found was that it didn’t. Specifically, they excluded the null result model with 97% certainty. So their data showed that it’s not nothing. Within the B-mode data there is a portion of it that is due to gravitational lensing. It isn’t all due to dust and contaminants, as some have feared. So does that mean they found evidence of early inflation? Not quite. They’ve shown that they can see a gravitational signal, but they haven’t proven that the signal is due to primordial gravitational waves. The authors are being cautious here, which is probably a good thing. So there’s hope that we will be able to observe the fingerprint of inflation (assuming it occurred). It just keeps getting more interesting. Really phenomenal writing, I certainly appreciate the lack of sensationalism in your articles as it gives me a much more accurate view of what the general consensus is by those who understand it best. Keep up the great work. Thank goodness for awesome science communicators like Mr. Koberlein. Luckily, the internet is filled with them, should you choose to find them. Special shout-out to Dr. Carolyn Crawford from Cambridge who puts on a fantastic talk series and public observing sessions at the Institute of Astronomy at Cambridge. I’ll miss living near there and picking her brain on Wednesdays. You can find her in Gresham College videos on YT. Yep, microwave radiation is light.